There are two new proposals for changes to zoning codes in residential zones; Better Housing by Design and the Residential Infill project. 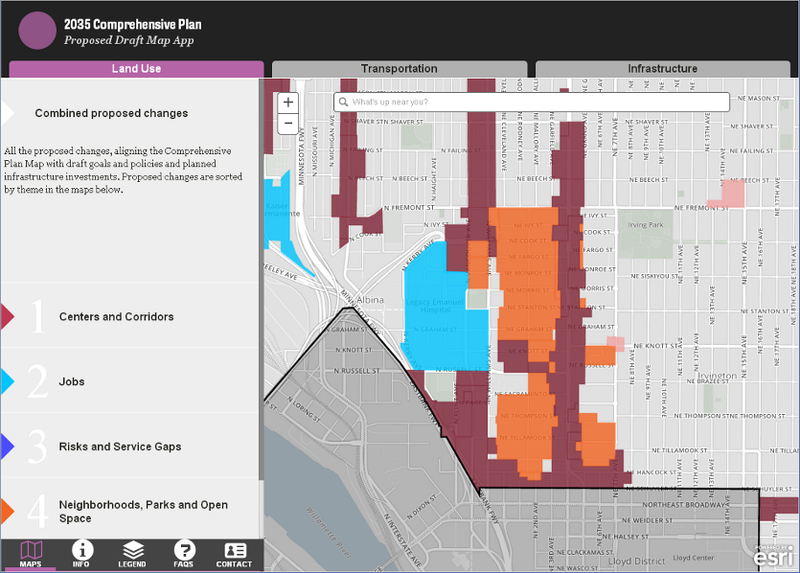 The recently (almost) completed Comprehensive Plan process changed “zoning;” where housing, commercial, and industrial uses can be located and the level of development intensity in each. 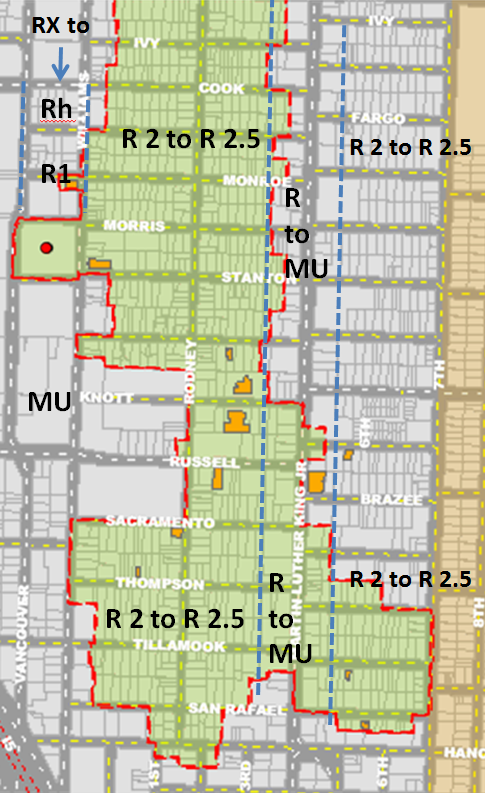 Residential zones are split between “single family” zones (R2.5, R5, and R10) and “multi-family zones” (R3, R2, R1, and RH) – each zone is listed from lowest to highest development density. 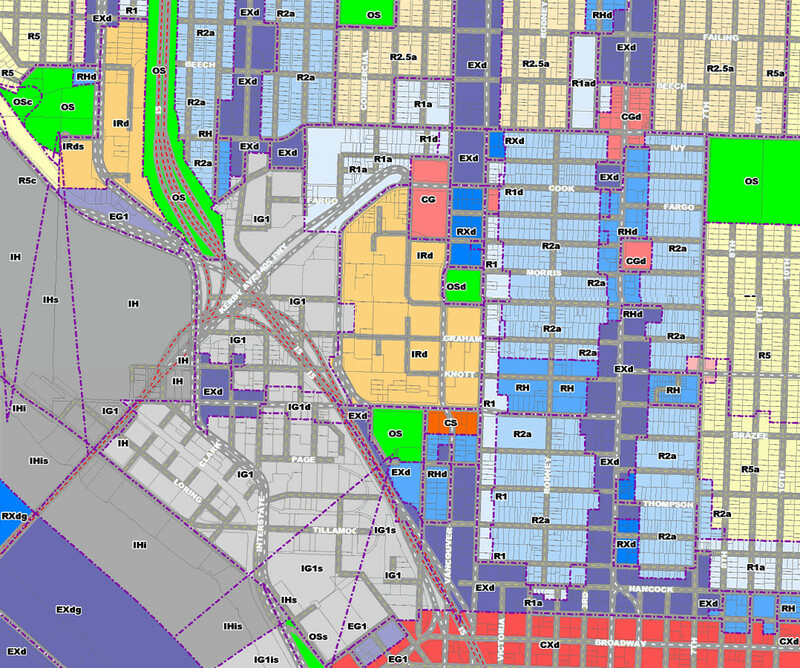 Roughly half of Eliot’s residential lots are expected to be rezoned to R 2.5 from the current R2 zone. The rest of Eliot’s residential zones are R 2 or higher. 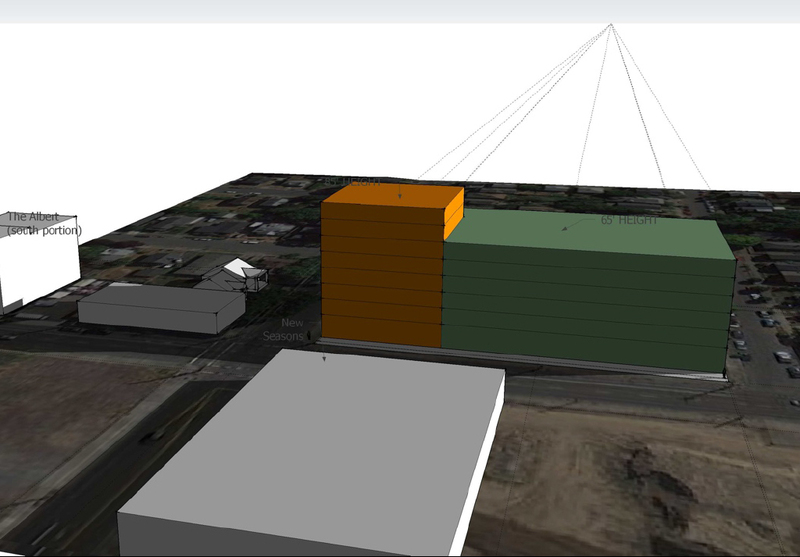 In addition, most of the properties along MLK and Williams/Vancouver are zoned CM for mixed use projects up to 65’ tall. Zoning Changes planned in Eliot. From the Map App. Much has been made of the Eliot historic conservation district rezoning proposal. Most of residential Eliot is being down-zoned from R2 to R2.5 which is more reflective of what is currently on the ground and slightly limits what can be built after tearing down an existing house. (The corridors are mostly getting up-zoned slightly and a new mixed use zone instead of the RX or EX designation they had before.) See the Map App for detailed information. The Portland Comprehensive Plan is a long range 20 year plan for land use and infrastructure in the city. The plan is currently undergoing an update as mandated by the state of Oregon. Last fall, the deadline was extended for input so you still have time to submit written comment on the plan until March 13th 2015. The easiest way to comment is using the Map App. The second Draft Comprehensive (Comp) Plan is out for review. As noted in previous columns, the State requires Portland to prepare a 20-year plan to accommodate expected future growth. The current Comp Plan was adopted in 1993 and is showing its age. The Draft Plan is expected to be adopted by City Council next summer. City planners are accepting comments on the plan through the end of October and a discussion of the Plan will be part of the General Membership meeting October 13th. This will be your best chance to comment before the final plan. Two public hearings are scheduled in October (the 14th and 28th), and comments can be submitted anytime using the “Map App” and other links on the Comp Plan web site. Eliot is one of the oldest areas in Portland and the best representative of a pre-automobile, streetcar neighborhood. The resulting intimate scale is one of the top reasons residents give for living here. Unfortunately, Eliot’s Historic Conservation District designation does little to preserve our history or character. The primary threat to Eliot is the existing zoning. Most people see zoning as something that interferes with the design and use of their property; however, its real purpose is to protect property owners from the designs and uses of their neighbors. No one wants to have a dirty, noisy industrial plant for a neighbor and zoning is there to prevent that. The Comprehensive Plan process continues. The second round of plan comments ended December 31. The Comp Plan, as it is called, is a 20-year blueprint for how the City of Portland envisions its growth and development in the upcoming two decades. It will affect how all of Portland’s neighborhoods and streets evolve, especially close in neighborhoods like Eliot. 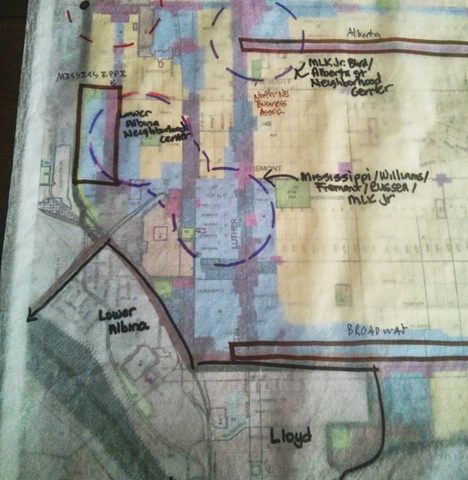 Some of the plan’s outlines were already agreed upon in the NE Quadrant Plan that was covered in the Eliot News previously. That two year effort proposed a number of changes to zoning along Broadway and into Eliot and west of Williams south of Russell. The current Comprehensive Planning process provides city planners with a once every 20-year opportunity to rethink planning processes and tools. It is evaluating two tools that are important to Eliot as part of that process; the Ex zone and “institutional” (hospitals and colleges) land uses and users. Our purpose is to protect and preserve the historic properties and character of the former City of Albina, to better align zoning to the prevailing development preferences of residential infill developers and to address underutilization of property over the past 20 years due to inappropriate zoning, both too high a residential density for single lots under separate ownership and parcels along MLK. It was with high hopes that residents of the Eliot and Boise neighborhoods took time out of their days to be active participants in the Design Advice Request (DAR) on Thursday. This was likely our last chance to voice our concerns over the development of the lot at NE Williams and Fremont and the future development of the overall neighborhood that each one of us has invested quite personally in. When City Council approved the zoning change from R1 to RXd, it was stated that the DAR hearing would be our guarantee of finding that middle ground where neighbors and developer would meet. This was not that place. It felt more like being stuck on a boat in the middle of the ocean, trying to yell for help to the mainland. And we only get to yell for three minutes. “Aleta” a Proposed Development on Williams and Fremont. 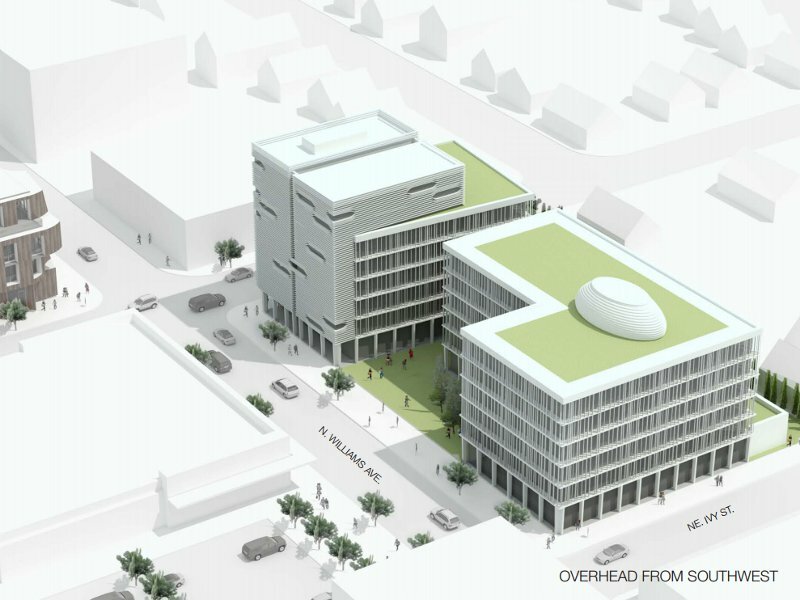 Ben Kaiser’s proposed 85 foot tall building on the SE corner of Williams and Fremont went for a “design advice review” by the Design Commission October 24th. The Design Commission only reviews projects upon appeal or through Type III permit procedures. Ben could have avoided this review but he agreed to it during the Council hearing on his zone change request. Exactly what he agreed to is in dispute. I believe he agreed to Design Commission review and approval but the Planning staffer assigned to the case, Hillary Adam, told the Commission he didn’t need to consult them further. We are seeking clarification. Decisions of the Commission can be appealed to City Council, otherwise it is Hillary’s call and Type II permit reviews don’t provide much protection to neighborhoods. 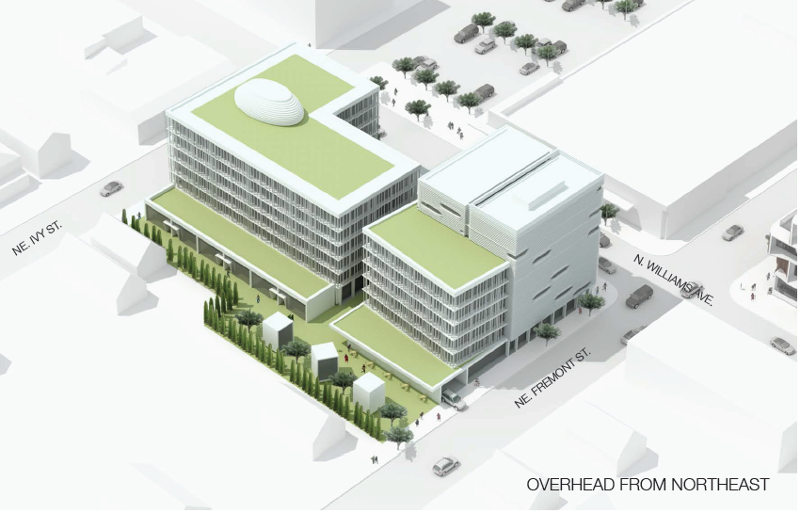 Proposed Development on Williams and Fremont. A group of neighbors that are most impacted by a proposed development on the corner of Williams and Fremont have filed an appeal with the Land Use Board of Appeals (LUBA) in opposition of a zone change made in June. They have also started a website for their cause. 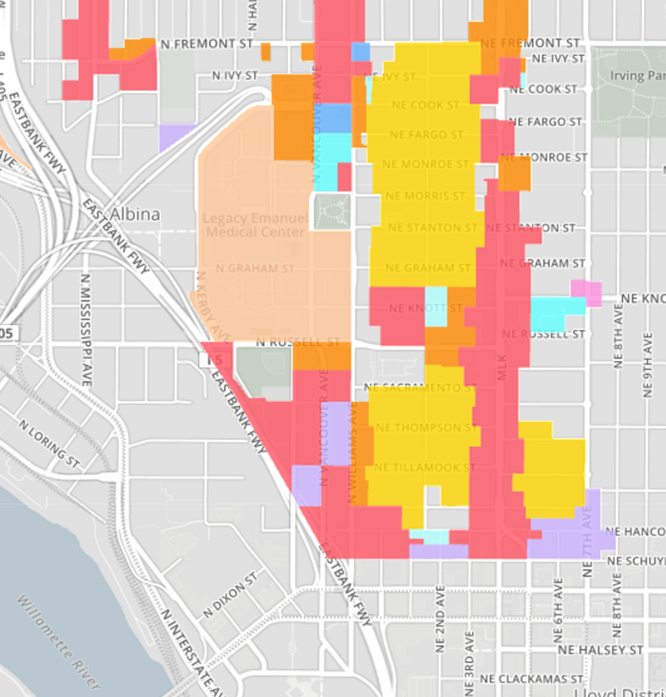 Portland is revising its Comprehensive Plan. Comp Plans are a State requirement and need to be revised every 20 years. 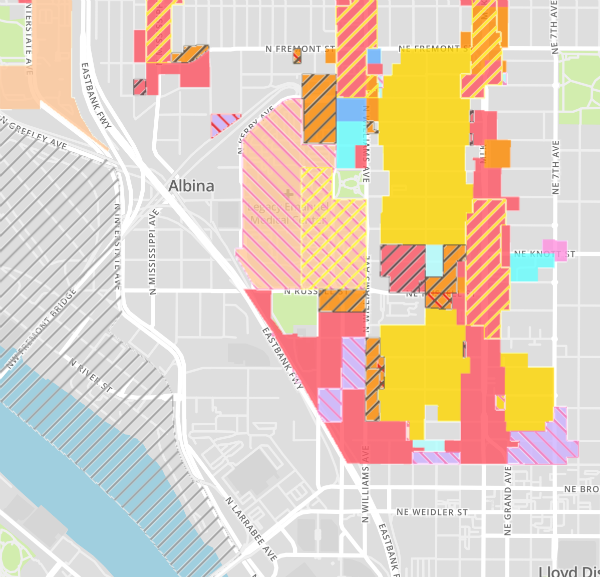 Eliot land use and zoning is currently covered by the Albina Community Plan and the Eliot Plan within it. Previous columns discussed revisions to the Central City Plan. All these plans were adopted over 20 years ago. Continue reading Time for a Change?